First and foremost, let me say very clearly that this is NOT a political post, it’s a post about design and the “bold” new design of the Family Dining Room at the White House which was just unveiled this week. I put italics around the word “bold” for a reason. the Hoovers’ designation, because they ate dinners in State Dining Room. um… little bit of a needle scratch I have to say. My first thoughts were that I hope it looks better in person than in a photo – which is very possible. Some spaces and palettes just don’t lend themselves well to being photographed. But, the room just seems very dull. If the goal was to create a modern space – then all the antiques and dated window treatments definitely get in the way of that and do nothing to highlight the amazing works of modern art that they have included. There’s a lot of conversations going on that the White House decor should always be traditional and historical. I don’t ascribe to this narrow viewpoint but I do think that it’s deserving of the very best that design has to offer and I’m not sure this hits that mark. Of course you can’t please everyone. 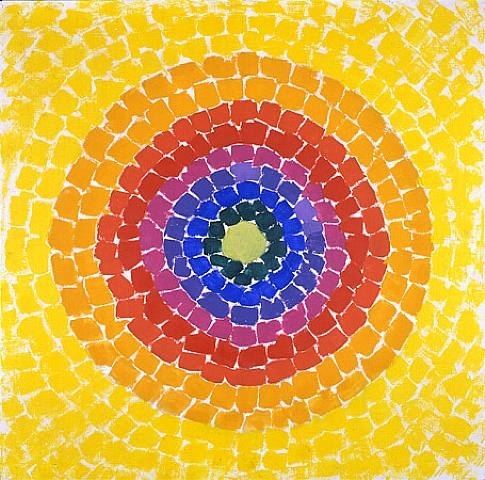 This is “Resurrection” by the African American artist Alma Thomas (1891-1978). As Mrs. Obama notes in her interview with Jenna Bush Hagar for The Today Show – this is the first work by an African American female to be shown in the White House. I think it’s beautiful and those who are calling it a bullseye are very off the mark. However, it doesn’t render as well at a distance I think, which is how we see it in the photo. It also seems very poorly served between the dull window treatments and over a cheap looking empty glass vase. Blaut, “Robert Rauschenberg: A Retrospective,” @Guggenheim (Fall 1997). Joseph Albers (1888-1976). The above is a screen grab from the interview. 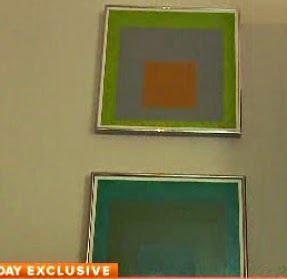 These pieces are passed over very quickly, but are clearly Albers’ work. Josef Albers (1888–1976) was an influential teacher, writer, painter, and color theorist—now best known for the Homages to the Square he painted between 1950 and 1976 and for his innovative 1963 publication Interaction of Color. both in their functional roles and as wallhangings. This piece above is a wall hanging that the rug is clearly inspired by. As individual pieces, all of these are wonderful and have historic importance in the American fine and decorative art world and I absolutely feel they have a place in the White House. But you just can’t dull down a room and slap art on the walls (no matter how important it may be) and call it a day. This is being touted as a “bold new design”. It may be new, but it’s not bold enough! Antiques and modern can be mixed and done beautifully. Here, not so successful. 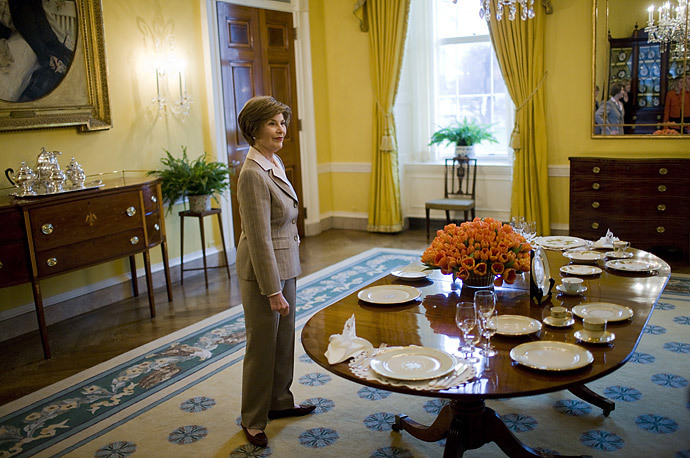 Michael S. Smith, who famously designed the private quarters for the Obama family as well as the Oval Office, played a role in this design as well. It’s not clear how much of a role (yet), but he does sit on the Committee for the Preservation of the White House. I think the biggest issue are the window treatments which just look a bit cheap and very dated. In the interview, it’s said that they are from Jackie Kennedy’s time – but I’m not sure if they mean that literally, or they are copies. It seems to me that this is “design by committee” and while they wanted to have some bold new artwork and a more modern space to show it in, they were afraid of backlash and tried to hedge their bets by retaining all the existing furniture and reusing (possibly) window treatments. But, to my eye, it’s a big failure. Simpler window treatments with straight drapery (and no sheers) with a beautiful textural banding would have been just right. Elegant but streamlined. A grass cloth wallpaper in a very neutral tone would have been the perfect backdrop to the art on the walls and also tie in with the textural carpet. I would also have swapped out the chairs for something a little more modern with perhaps an upholstered back. 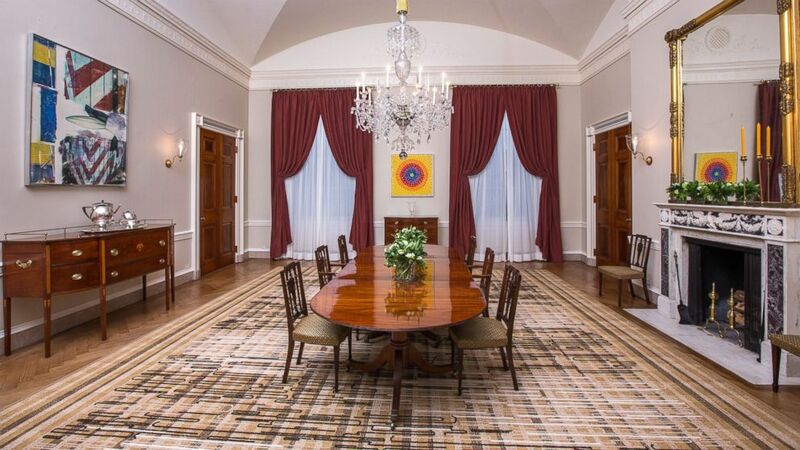 A few other notes: All White House public rooms are decorated using privately raised funds and furnishings and art that are often part of the Smithsonian’s Collections or are on loan from other museums. Incoming first families receive a small amount from public funds to decorate their private residence and anything else they want to do they pay for themselves. I would assume that art and some furnishings may be borrowed as well. All First Ladies get criticized for their choices – too fancy, too expensive, too dull, too… something… We often hear naysayers exclaim that the money spent should have been better spent on the poor and it’s just an example of profligate “Let them eat cake!” spending. But the thing is – it’s the White House. We only have one house like it in the country and it’s not really all that big if you compare it to European castles. Before the Truman’s, the house was a mold-filled dilapidated mess. We should be proud that OUR house is beautiful, is well-maintained and lots of careful thought and consideration is put into the public spaces. And, it should be a showcase of American design and craftsmanship – from the beginning of our history to the present day. I do think that the newly refurbished fits this bill very well. While maybe not to my personal taste, it’s thoughtful, beautiful and showcases American design. A pie for giving thanks!